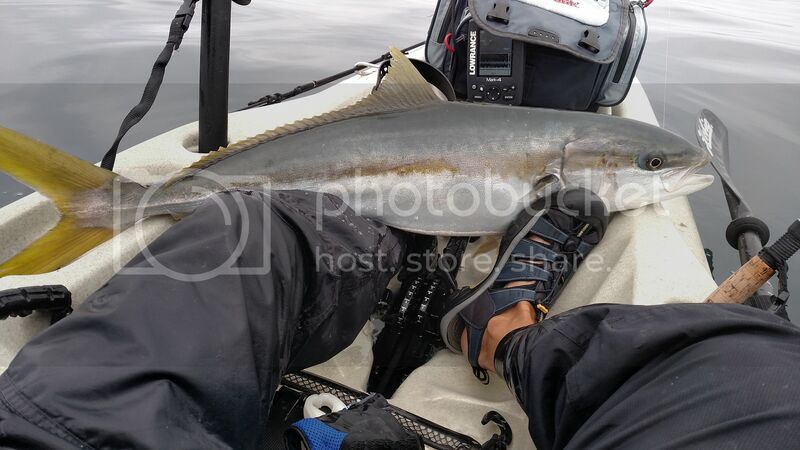 Kayak Fishing Adventures on Big Water’s Edge - View Single Post - What are these balls for...Yellowtail? Thread: What are these balls for...Yellowtail? 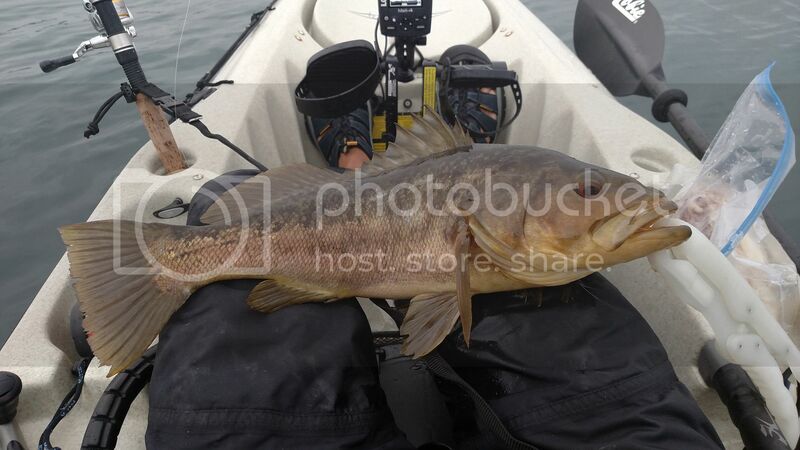 This is a Kayak Fishing Report from Solana Beach on 8/9/2015. I launched from the Del Mar River mouth to mild surf at first-light. It was difficult finding bait in the immediate area so I headed north to a previous "hot bite area" to see if I would have any luck there. I guess the bite was still on. Not only did I fill the live-well with the target species (GBMs) but I caught several Barracuda and three Calico Bass. One Bass being 19-inches and great fun on my small Shimano. Since the tank was full (enough) it was time to head out to deeper waters. 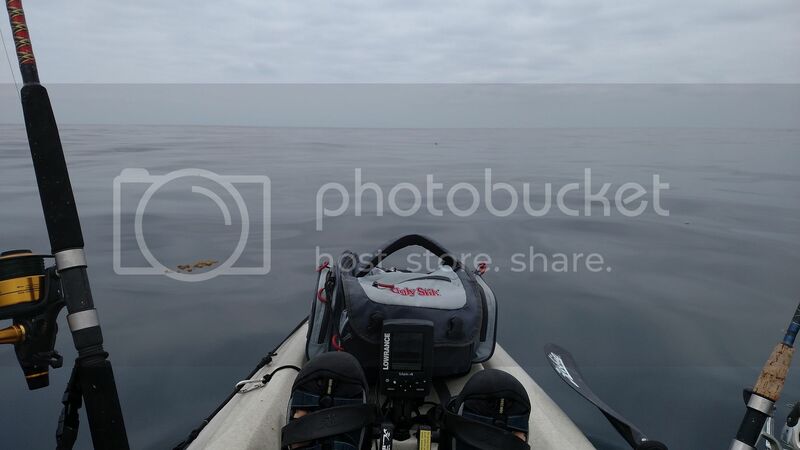 Seeking to explore more remote opportunities I made my way past a few kayakers on the outer kelp. The day continues to unfold in splendor as the east wind helps to push me but then subsides and gives way to glassy conditions. Did I mention my Fish Finder craps-out at 330-ft? Well it does and it did again. Somewhere past 330-feet, I turned and made my way north for a few miles following the GPS's depth contour line and trolling a GBM. After this long haul north, following the haul heading out and no bites to show I turned inland. Aafter passing a green buoy like one I passed on the way out (but further south) my reel goes off. It would be the first of three decent Yellowtail catches in fairly short order along my return route. For measuring convenience, I have marked my paddle incrementally to 28-inches. Given these YTs were longer than that and because they were feisty in the yak, it was a bit tough to precisely measure them. I either gill-grabbed or lip-gripped them so they could be released...no gaff. 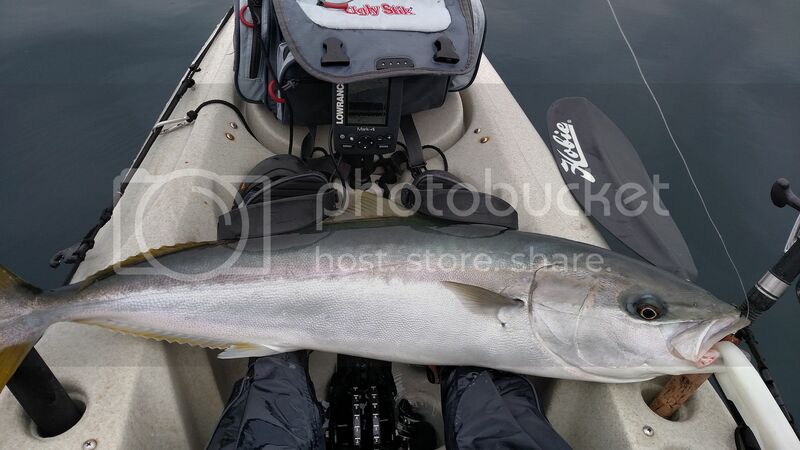 Yellowtail #1 - Probably 36-inches to the fork. 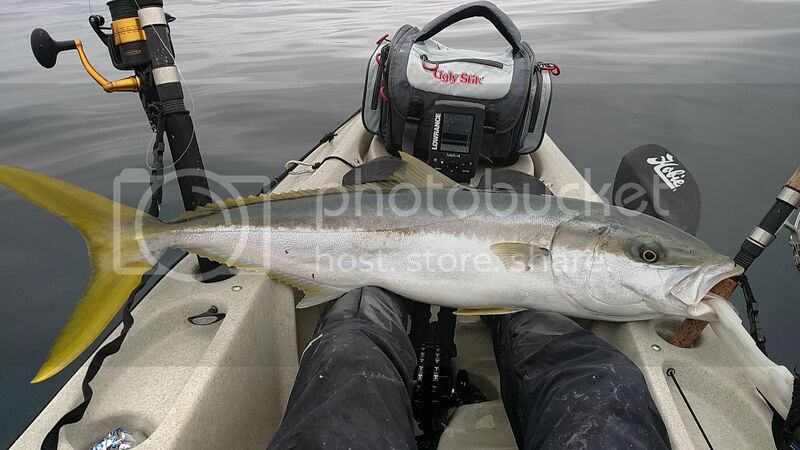 Yellowtail#2 - Probably 35-inches to the fork slightly fatter then #1. All YTs were admired, photoed and released. OH...and finally....does anyone know what these balls are for? There seems to be a line of them both Green and Orange coming up from Del Mar, through Solana and into Cardiff. 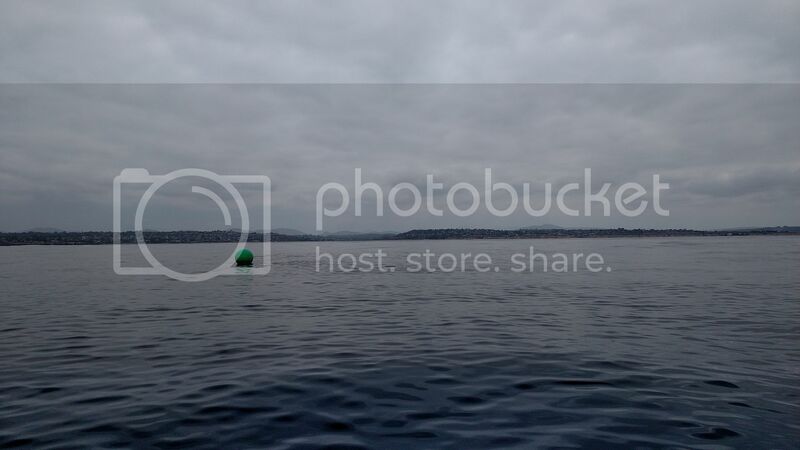 They don't appear to be your garden variety crab-pot buoys. Do you mean San Dieguito river when you say Del Mar river? And where is table tops?